One thing I’d like to force myself to do more often is play with the female characters’ expressions in BitF. I think I too often fall into the trap of needing to have them look feminine and attractive…but that’s hardly ever the funniest outcome! I’m rather pleased with how frazzled Zelda appears here. I also debated the use of “dollars” instead of “rupees” at the end, but I ended up going with the one that was more immediately understandable and rewarding. 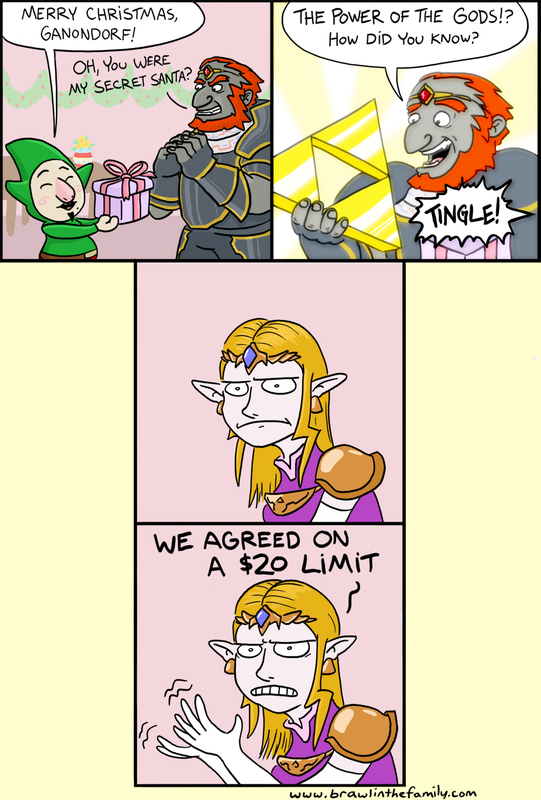 Besides, this is a comic strip where Tingle is giving Ganondorf the Triforce in a box; the currency is hardly the weirdest thing about it.